RO: How did you start working in the eating disorder field? BM: I knew that I wanted to work in mental health forever—well, for a long time, but it was kind of affirmed in school. There’s such a need for it and there are so few jobs available in [mental health], which is especially astounding given the fact that that’s where we started. That said, I started my journey looking for any sort of mental health type things that I could get involved in, and I found out that [Johns] Hopkins has a residency program, and then ended up being offered a full-time job there instead of the residency, and the two services that I would be covering would be eating disorders and young adults with affective disorders. Both are pretty difficult niches, so I was initially a little bit overwhelmed to say the least, but I liked the fact that it’s definitely an area where we have the opportunity to make a difference and make an impact in those people’s lives, and really give to them and they have a lot to give back to us. 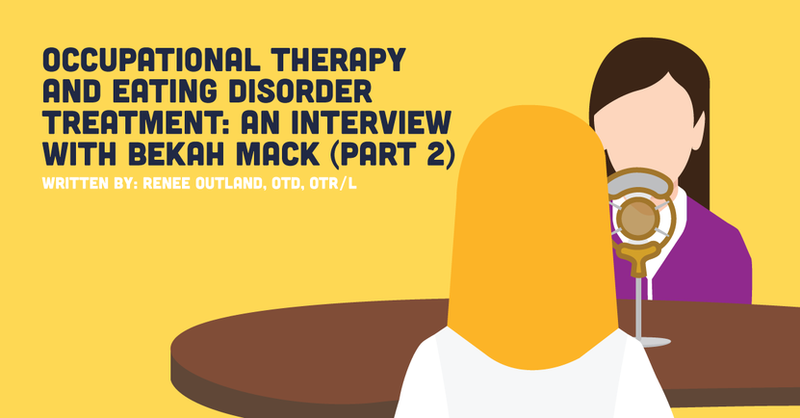 So, while I’ve always found eating disorders interesting from the little I knew about them, I can’t say that I necessarily started by looking for a job treating them, and I didn’t really have a very firm grasp as to the depth and complexity of them until I started working here. RO: Had eating disorders been covered at all in your grad program, or when you say, “the little I knew,” was that from life experience? BM: A little of both. I have several friends who have struggled with eating disorders, and I was also aware of the stereotype versions of it just based on TV shows and movies and those sorts of portrayals; the “oh, they’re just afraid of food or have a bad relationship with food” idea that’s still unfortunately the stereotype. It’s not about [causal items]; it’s so much more complex and akin to an addiction than it is to a fear that came from one event. As far as grad school, we didn’t cover a whole lot. We had a biopsychosocial class that was really like the core foundation of my psych background, and then everything else mental health was [woven] into the program. My professors always said, “we really do have a really heavily based mental health program,” [but] we didn’t really talk a lot specifically about eating disorders other than kind of glazing over it as a DSM diagnosis and watching a couple videos from The Doctor or Doctor Phil or something. RO: With that limited exposure, what was it like to start working at Hopkins? BM: I was really blessed to have a mentor, who actually still works at Hopkins, who helped train me for it, and I spent probably a month and a half at least, if not two months, of getting to follow her around and get a better understanding of the culture, and then taking over bits and pieces with her there to support me if needed. I’m very comfortable with the job now, but initially it was very overwhelming because — I don’t know if you’re familiar with Hopkins’ program at all — it’s very, very intense and a different culture — exemplified in the fact that we have a rule book that’s like 10 pages long. [The eating disorder program is] very structured in order to be able to address everybody’s needs. RO: Would you mind telling me more about the program and how it’s structured? BM: I work specifically in the inpatient [IP] unit, and then we have a PHP [partial hospitalization program], and then I occasionally take outpatients. But the inpatient unit is a locked psychiatric ward that’s shared with the adult affective disorder patients and the young adult affective disorder patients, which has pros and cons. People who are significantly depressed may binge or restrict unintentionally without it actually being eating disorder behavior, which can have a complicated effect on the milieu, but it can also be good because patients are engaging and having the opportunity to socialize with people who are struggling with an illness that isn’t theirs. On top of that many people with eating disorders often have comorbidities of depression, bipolar, anxiety, so there’s a lot of good things that I see coming from those groups being together. The biggest goal of having people inpatient is to do two things — the first is to break the cycle of the eating disorder behaviors, whatever they might be. Typically we see individuals struggling with various forms of bulimia, all forms of anorexia, and occasionally binge eating disorder. But because the people coming to the IP unit are going to be those who are more chronically ill and more acutely ill; most of them come with an anorexic diagnosis because they need to be medically stabilized before they can go through the refeeding process.